Graduated from Berlin Technical University (1969). 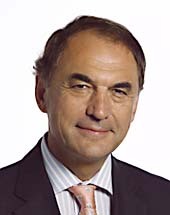 Founded the V. Öger Company (1990); founded Öger Türktur GmbH (1973); founded Öger Tours (Managing Director) (1985). Member, Federal Government Immigration Commission (2000). Board member, German-Turkish Foundation (1998). Federal Cross of Merit with ribbon (2001). Order of Merit of the Turkish State with distinction for special services (2001).